I am always looking for kid (and adult) friendly recipes that the whole family will like. This definitely fits the bill. Thanks to @scatteredmom for posting pictures on Facebook and Twitter so that I knew what to fix for dinner! To make this extra special serve it with Coconut Ginger Rice. In a small bowl whisk the soy sauce, cornstarch, sugar, chicken broth, sesame oil and hot pepper sauce together. Set aside. In a large skillet or wok, heat vegetable oil over high heat. Add the chicken thigh pieces. Cook until browned and cooked through. Remove chicken and set aside. 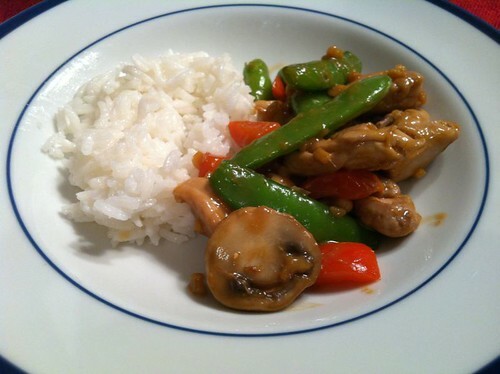 Add snap peas, mushrooms, bell pepper, cashews, garlic and ginger to the pan. Stir fry until the peas are bright green & tender crisp and the bell pepper is beginning to soften. Add the chicken back to the pan and remove from heat. Add the sauce mixture to the pan and stir to combine and coat the stir fry. Serve with Coconut Ginger Rice and enjoy! Don’t forget to visit Shan to see what else is cooking this Wednesday!